The Bourn Windmill, located in the town of Bourn, Cambridgeshire, is reportedly England's oldest surviving Windmill of its type. The earliest mention of about it is in the official records of its change of ownership in 1636, but it may have been constructed much earlier as this type of 'open trestle' post mills were in use from as early as 13th century. 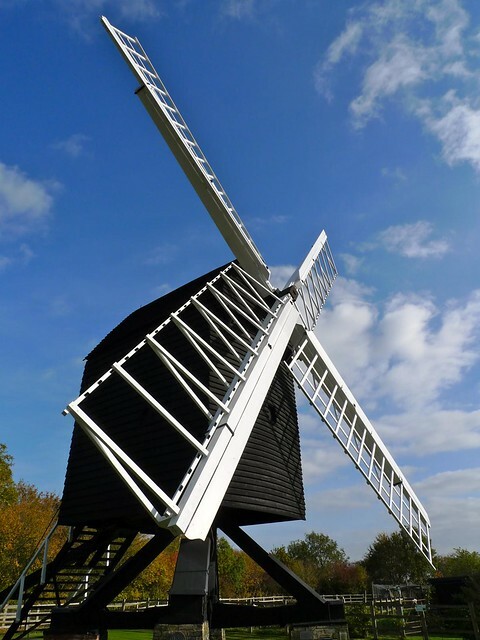 The windmill is 9.6 metres (31.5 feet) high and its two floored body containing the machinery is about 3.2 metres (10.5 feet) by 4.42 metres (14.5 feet). The mill was functional till 1925 when it was damaged by a gale. It has since been repaired/renovated but is not in use. The mill however is winded on the open days (usually last Sunday of each month) when canvas sails are clothed over the wings. "I would research a little more before advertising the mill as "the oldest". The oldest DOCUMENTED windmill is in Pitstone, Buckinghamshire (1627)." In reply I would like to add I always do research before making a post and I am well aware that Pitstone, Buckinghamshire is the oldest recorded windmill. However there are many references on the web as well in the books which claim that Bourne Windmill is THE OLDEST. A few such references are being reproduced below; I leave it to my readers and historians to decide as to which Windmill is oldest! 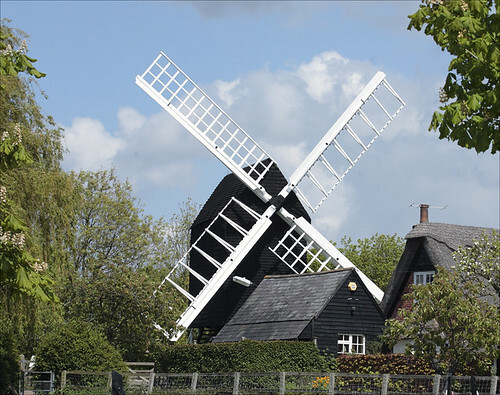 "The small post mill at Bourn, which stands almost on the parish boundary with Caxton, is generally regarded as the oldest surviving windmill in the country, although the mill at Pitstone, Buckinghamshire, is the earliest dated mill. The earliest reference to the mill at Bourn is 1636 ....."
"It is the oldest dated mill in the country, probably considerably older than the earliest title-deeds of 1636 ......"
"Although this tiny windmill cannot be dated exactly, it is considered to be the oldest surviving open trestle post mill in Britain. A deed of 1653 mentions it changing hands in 1636......"
"Bourn Windmill, which in 1931 was given to the Cambridgeshire Preservation Society, is the oldest surviving open trestle mill and is known to have been sold by deed in 1636 to Thomas Cook of Longstowe." "..... the earliest standing post-mill is at Bourn (Cambs), which was in existence by 1636." I would research a little more before advertising the mill as "the oldest". The oldest DOCUMENTED windmill is in Pitstone, Buckinghamshire (1627).